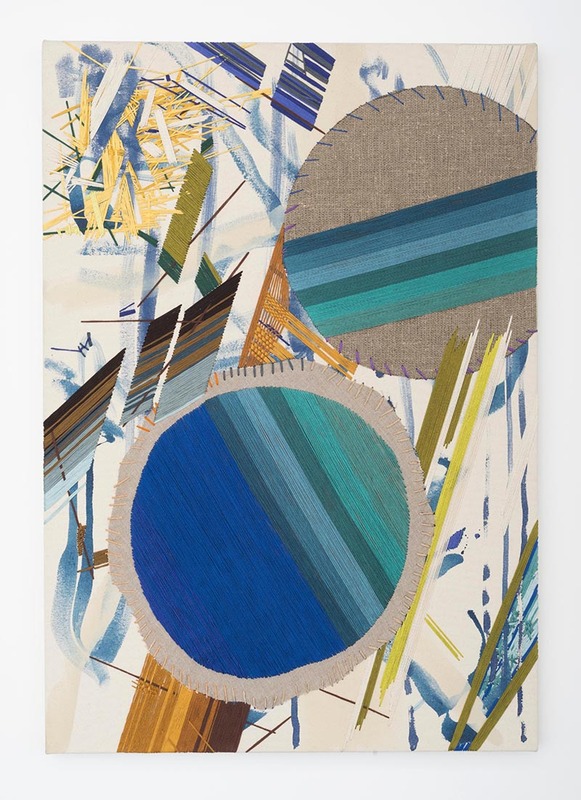 This is not a roundup of fiber art exhibitions currently on view around town, though that temptation perpetually lingers because at any given moment in Chicago there are plenty of artists exhibiting smart hybrids of textile and painting, fiber art and installation. This is no doubt attributable in part to the Fiber and Material Studies department at SAIC—still a rarity with few comparable programs around the country—and more generally the deconstructive, interdisciplinary thrust of most of the fine arts programs to be found here. The aftereffects of Modernism in Chicago aren’t really the Greenbergian isolation and purification of a medium’s potential; instead, painting’s frequent conflation with sewing is a recurrent signal of a Modernist project to apply the arts broadly across other parts of life—keenly designed forms for living integrated with art-making as was seen in the De Stijl and Bauhaus (and its offspring, Chicago’s New Bauhaus begun in the late 1930s). Modest and succinct or madly layered, a few artists’ current projects carry us into this new year with propositions for art’s visual and material elements brought in various proximities of closeness to the lives being lived around its production. 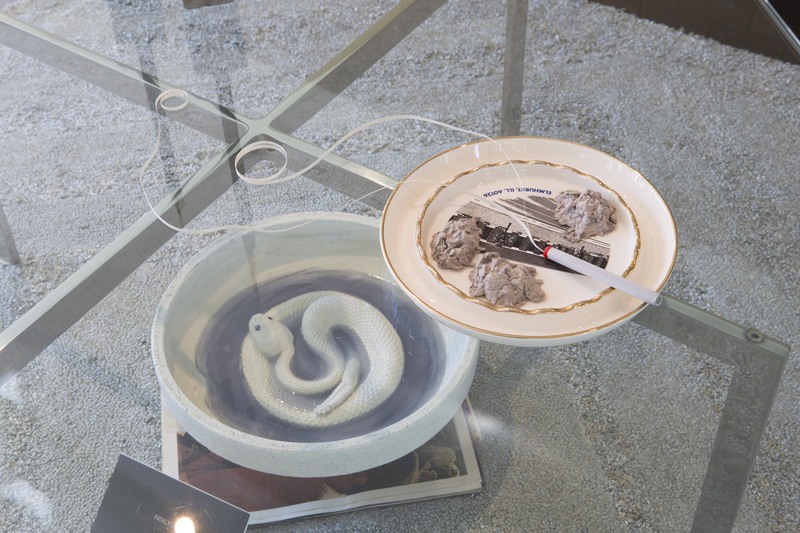 Edmund Chia’s devoted work as a teacher, the ambitious exhibitions he mounted at PEREGRINEPROGRAM and the enthusiasm with which he has embraced and supported Chicago’s art community have run the risk of occluding his own artistic practice. He lives and works in Singapore now, and the nine paintings that comprise his current exhibition at Paris London Hong Kong—one component of a multi-disciplinary collaboration with David Salkin—have been immaculately crafted, selected and spaciously hung. Implosions of painted jazzy geometric shapes and zigzag stitches in highly chromatic embroidery floss are redolent of El Lissitzky’s hopeful “Proun” works. Each painting competes for best in show, with most works sticking to a nearly-monochromatic palette save for the larger “Diagram 02 for New Architecture with David Salkin,” a collision of seascape blues and hushed mid-century modern yellow and green. “Diagram 00” and “Diagram 07” are the barest of the bunch with careful interruptions in simple grid arrays of stitches. Here is a demonstration of Chia’s aesthetic instincts at their best and a reminder for us not to overlook his art amidst his many other generous goings on. Michael Milano and Katy Cowan titled their current exhibition at Devening Projects “work : work,” a direct nod to art’s involvement in broader conceptions of labor. The two chose to intersperse their work rather than mount separate displays, which may suggest a kind of workaday camaraderie they might have wanted, but more often jarred the viewer when one’s work interrupted a grouping of the other. Milano (one of the progeny of SAIC’s aforementioned fiber program) shows a series of grid-based appliqué pieces composed from distressed cloth cut into squares, strips and triangles and sewn onto bare canvases. 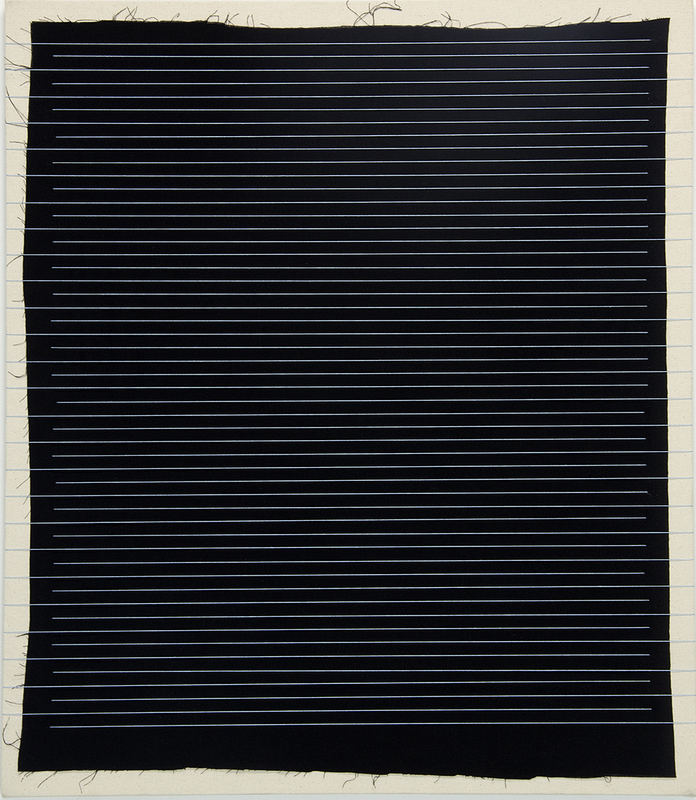 Milano’s affectation of a day-laborer-Agnes-Martin is more than a little appealing, and in some of his most engaging canvases, exercises in seams ironed flat or squares of fabric held down with parallel lines of thread quiver with optical sensation. Cowan contrasts Milano’s quietude with comparable disquiet in works that collapse art and life into one another more bluntly by submerging bits of detritus and quirky castings of body parts into blocks of wax in a mode similar to Jedediah Caesar or Heidi Norton. It’s not just artists working on new concepts for how artistic disciplines can be involved with stuff beyond its traditional scope; there are also exhibition spaces that have rejected the posture of purity in a white cube gallery in favor of bringing home life in direct conjunction with art display. For instance, the McCormick House—a Mies van der Rohe home completed in 1952—is attached to the suburban Elmhurst Art Museum as an exhibition space for site-responsive work. Its latest inhabitant is Laura Davis’ installation “Histrionic Restoration” (note the exchange of “historical” for a pathology for emotional wildness with an especially gendered bend), which has demanded a lot of looking and thinking and is accompanied by an overwhelming itemized materials list that notes how much you probably overlooked in previous passes through. There’s way too much, but that’s precisely the scrutiny Davis directs at the slimming, trimming work of history and particularly Modernist taste. 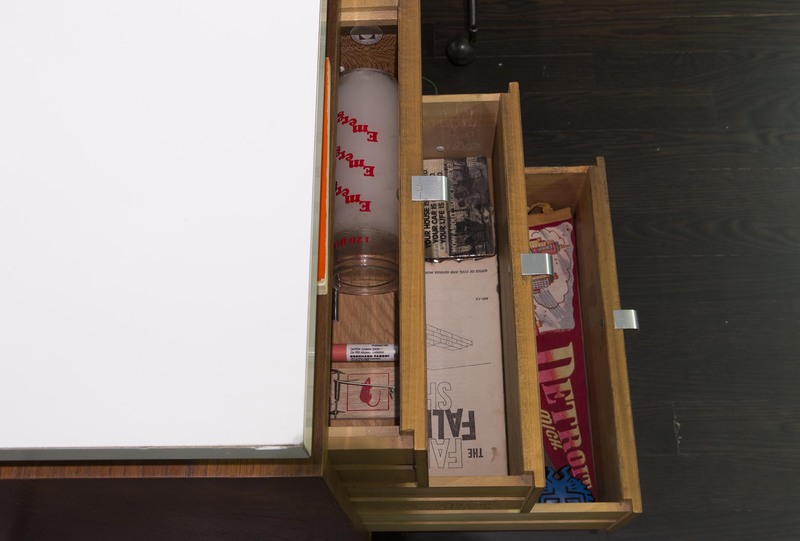 Hers is a composed madness that incorporates small text plates (“WE PING HISTORY”), evidence of her research into the McCormick House, brazen juxtapositions between upper- and lower-class aesthetics, and insinuated narratives, such as the contents of the desk drawers stuffed with emergency candles, a mouse trap and a pamphlet about bomb shelters. Underneath every table there seems to be a coiled serpent or some other lurking threat; a fleshy pink electric exercise bike groans in motion as a metaphor for the exhaustion brought on by a century’s push for evermore progress. With just days left of the exhibition, there’s a short run of handmade books available at the Elmhurst beyond the closing date that fully conjures the psychological dread everywhere pointed to by Davis’ collage of castoffs in a set of nighttime shots of the installation. Whether aesthetic choices are a substantially integrated aspect of living or a detached artistic pursuit without practical application is an underlying question posed everywhere in these shows, and, indeed, an ongoing crisis for art in the face of Chicago’s hardworking Midwestern mindsets. All of these projects veer over into decoration only to then lay claim to fundamental ways that the forms and materials with which their makers play correspond to an everyday that has long outlived their Modernist precedents. At their base, each exhibition charges us with reflecting on what we do with our lives and what those actions look like.